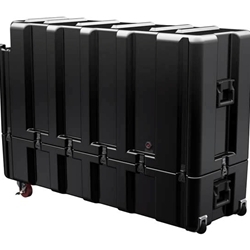 This Pelican Hardigg Case has been custom designed in order to store and transport 40" - 48" LCD and Plasma flat screen monitors. This case comes standard with 2 recessed edge casters for ease of mobility. The interior of this case will be customized to the dimensions you will have to provide us for your screen. Depending on the size of your screen, there will be additonal space for accessories in the case. If this seems like a good option for you or your company, please give an Atlas Case salesperson a call to discuss the custom foam interior and to order this case. Interior Dimensions54.62" x 15.88" x 35.88"
Exterior Dimensions57.06" x 18.87" x 39.62"
Shipping Dimensions59" x 21" x 42"